Facebook recently patched an information disclosure vulnerability that exposed page administrators, researcher Mohamed Baset reported this week. Baset claimed he discovered the issue, which he described as a “logical error,” within a few minutes of receiving an invitation to like a Facebook page on which he had liked a post. 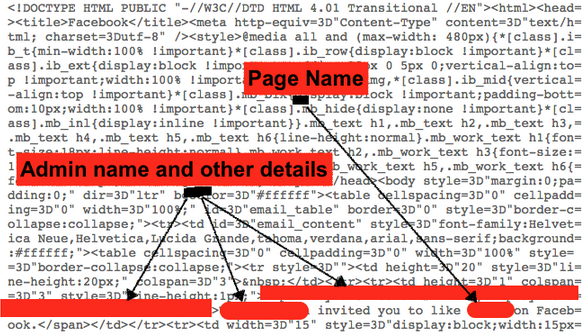 Looking at the email’s source code, the researcher noticed that it included the name of the page’s administrator and other details. After being notified through its bug bounty program, Facebook acknowledged the vulnerability and decided to award the expert $2,500 for his findings. Sophos’ Paul Ducklin has provided an explanation on why such an information disclosure flaw can pose a problem to Facebook page administrators. “If nothing else, this protects individual employees from getting bombarded with comments and questions – whether they’re praises or rants – in place of the account itself,” the expert added. Baset, founder and lead penetration tester at Seekurity, said this was the second time he reported a vulnerability to Facebook without having to write any code to demonstrate his findings. Facebook reported recently that last year it paid out more than $880,000 for 400 valid vulnerability reports submitted by white hat hackers.